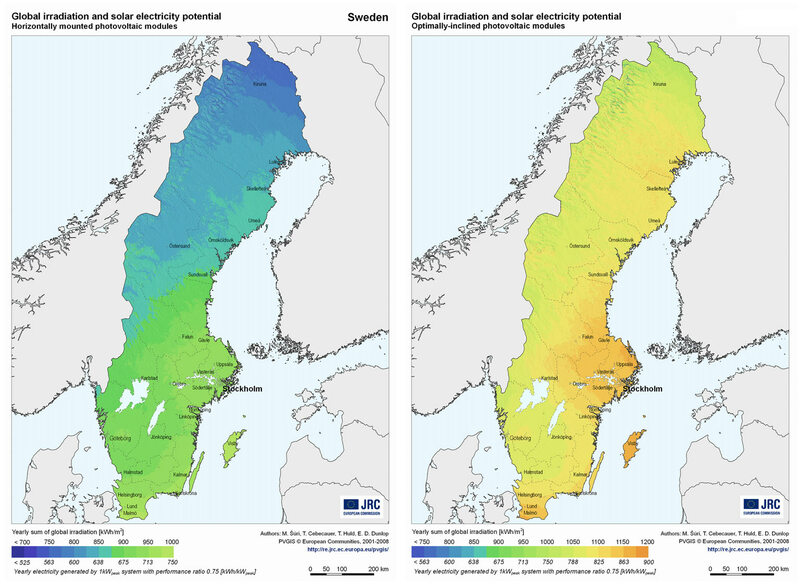 For the majority of Swedes who live in the South of Sweden, the annual solar irradiation is not much lower than in other European countries, where the uptake of solar energy is much higher. The two figures below show the global irradiation in Sweden on a horizontal surface (left) and on a optimally-inclined surface (right). It might be that for various reasons, the goal is not to optimise a solar system for the maximum amount of production per year, but to suboptimise the system to get a more even distribution over the year. 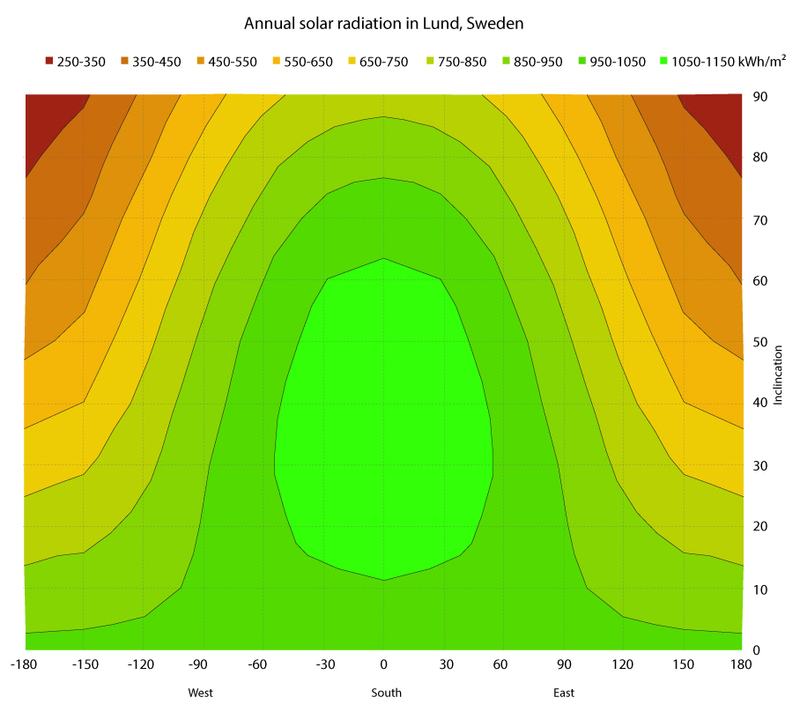 The following figure shows the difference in annual solar irradiation on a surface in Lund, Sweden. The incoming solar energy can be converted into heat by means of Solar Thermal panels (ST) or into electricity by means of Photovoltaic cells (PV). The two technologies have different subgroups and different appearances. The most common PV cells are the crystalline cells; the most common ST panels are the flat plate and evacuated tube collectors. It could be said that a standard PV has an efficiency of around 15%, a ST panel around 40%, although it is very dependent on other system components and the manufacturer. The installed effect of solar energy in Sweden has increased rapidly the last years, although the installed effect per capita is still very low compared to other European countries. Different aspects affect the conditions for installing solar energy; the price of solar systems is of course a crucial factor. The last years, prices have dropped significantly (see figure below). A typical price for a PV system right now (2014) is around 15000-20000 kr/kWp. 1 kWp is normally around 6.5 m2 (depending on the system efficiency). Countries can drive the uptake of solar energy by creating favourable legal conditions. Effective political instruments are feed-in-tariffs, net-metering and subsidies. Feed-in-tariffs is the obligation for utility companies to buy energy produced by renewables for a set price per kWh. Net-metering is a service to an electric consumer under which electric energy generated by that electric consumer from an eligible on-site generating facility and delivered to the local distribution facilities may be used to offset electric energy provided by the electric utility to the electric consumer during the applicable billing period. Subsidies provide financial aid for those who want to install solar energy. Currently, Sweden only has a subsidy system in place with a limited amount of available money (administred by the counties). There is NO net-metering or feed-in-tariff regulation in place.